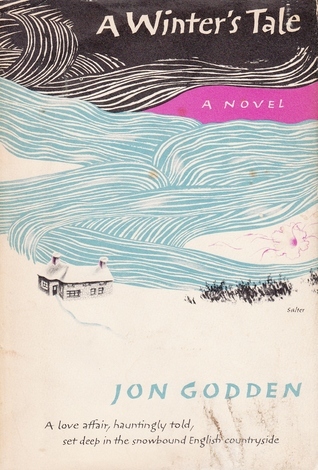 Jon Godden’s A Winter’s Tale is an old book in more ways than one. Published in hardback in 1960, and apparently not reissued in any other editions, it was an Op Shop find, still with its original somewhat battered dust-jacket. I picked it up because I’d enjoyed the novels of the author’s more famous sister Rumer Godden, and I’d read the memoir Two Under the Indian Sun which was a collaboration by the duo. (Yes, another writing duo!) But the book is not just old in age, it’s old-fashioned in style. I can’t imagine anyone writing a story with this plot and characterisation today. Jerome is a successful writer of plays and novels, living in a remote country house in the English countryside with his former batman Peter, who brings in additional income for the household by breeding orchids. Peter was disfigured by a shocking accident during the war, and since his wife left him he prefers to live an isolated life, venturing only to nearby farmhouses for supplies. Jerome needs peace and quiet to write, visiting London only occasionally to see his plays on opening nights, and to have casual, light-hearted affairs with a succession of women. No one has ever visited the house since Jerome bought it as a workplace. With only a magnificent Alsatian dog called Sylvie for company, they live together in contentment, Peter doing all the household drudgery, and Jerome writing his books and plays. Into this apparently idyllic life blunders Una, a foolish young actress [sic] who fancies herself in love with Jerome. On the day that she arrives, a severe snowstorm makes the house snowbound, and the men are forced to give her shelter. Although she is ditzy and irritating, the inevitable happens and the dynamics in the house change, most notably regarding the dog. From being the sole focus of attention, Sylvie has to compete for Jerome’s affections with Una. Peter also resents Una’s presence and doesn’t try to hide it, and Jerome resents being challenged over his casual dismissal of a dog that is devoted to him. Out of this unpromising material, Godden makes a compelling psychological thriller. With all four characters confined inside the house, the mood is sombre and claustrophobic, and the tension builds to a climax with unexpected repercussions. It is skilfully done. What makes the novel so old-fashioned is the heavy-handed sexism in the characterisation of the girl. Unlikely to gain any reader sympathy except perhaps for her naïveté, Una behaves like an annoying child rather than an adult. She can’t amuse herself, she never stops talking, and she is entirely dependent on Jerome for her self-esteem. Narcissistic and immature, she is the antithesis of today’s modern young women, and Godden, putting sexist commentary into the mouths of Jerome and Peter, goes out of her way to depict her without dignity. But the novel has redeeming features. Back in 1999, I read Anne Chisholm’s biography, Rumer Godden: A Storyteller’s Life and learned that Rumer Godden was aghast when she found herself pregnant with her last child because she had thought she was free at last to devote herself entirely to her writing. So I was interested to see this motif of a writer’s needs crop up in Jon’s book too. Una reminds him that Jane Austen wrote amid her family, but Jerome says he cannot do it. To think and write he must have not only silence, but also no threat that the silence might be broken. Although he’s not a reader himself, Peter gives the necessary self-absorption of the writer full rein so that Jerome can work uninterrupted when the muse calls. Grateful because the arrangement lets him lead the kind of life he wants, Peter’s complete lack of resentment at being at Jerome’s beck and call has made him more of a friend than a servant, even though they seem to have nothing much in common apart from a love of orchids. Source: personal library, $2.00 from the Op Shop. Out of print. Try the Op Shop. I love the cover; it looks strangely contemporary. It’s by George Salter, and on the back there’s a lovely photo of Jon Godden looking through a Cotwoldish sort of cottage window. She has her blonde hair in a chignon, and her outfit, what I can see of it, is 1950s fashion. It’s good book design, in the way of most hardbacks of that era. I like the cover as well. It reminded me of a cover I’d seen and liked in lizzysiddal’s blog review of a book by Robert Seethaler called A Whole Life. Jonathan, do you think you are influenced to buy/read by a book-cover? Definitely Lisa. The cover, the type of paper, the font used etc. These are all things that can influence me but in the end the writing has to be good. Yes, me too. But I can be put off by certain types of covers. I associate all large gold lettering with Sidney Sheldon et al, and I associate nearly all stock photo covers of females with limp romance! I’ve noticed that a lot of modern book covers have figures facing away from us. Have you noticed that? Yup, they’re everywhere in popular fiction and sometimes LitFiction too, though it’s generally the bigger publishers that do it, not the indies. They are a major turnoff for me.